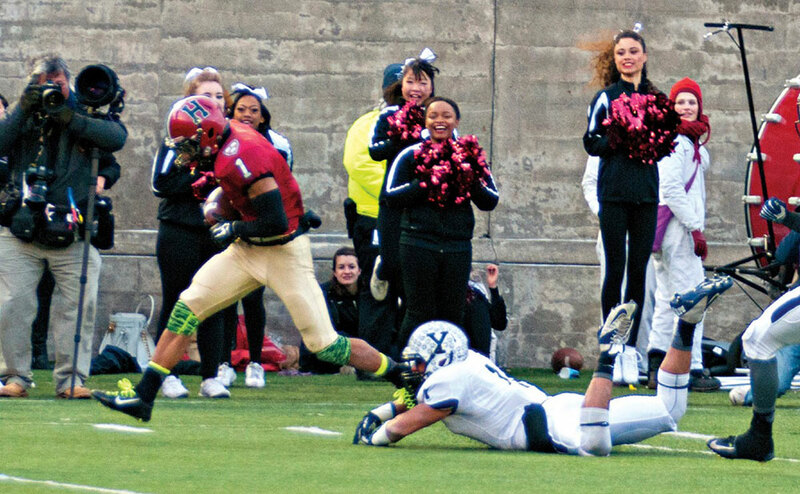 The play that made “slant and go” part of Crimson lore: having put a double move on Yale’s Dale Harris, Andrew Fischer ’16 capered into the end zone after catching the winning pass from Conner Hempel with 55 seconds left. 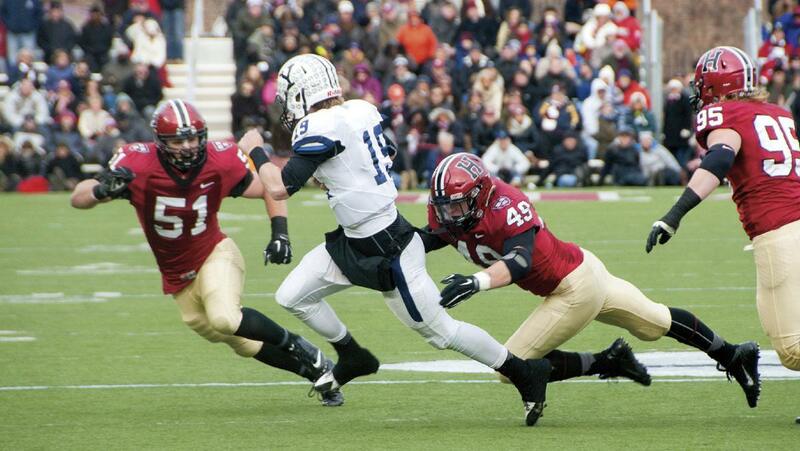 As so often happened this season, an opposing quarterback—in this case, Yale’s Morgan Roberts—had nowhere to run against marauding Crimson defenders such as linebackers Jake Lindsey ’16 (number 51) and Eric Medes ’16 (number 49), who were helped by defensive tackle Miles McCollum ’17. Assuming ground control on the Dartmouth game’s opening drive, running back Paul Stanton Jr. ’16 rumbled behind center Nick Easton ’15 (number 57) to a pair of touchdowns and a game total of 180 yards. Slate-gray skies and trepidation shrouded the home side of Harvard Stadium late in the afternoon of Saturday, November 22. In the big picture, the anxiety seemed unwarranted. 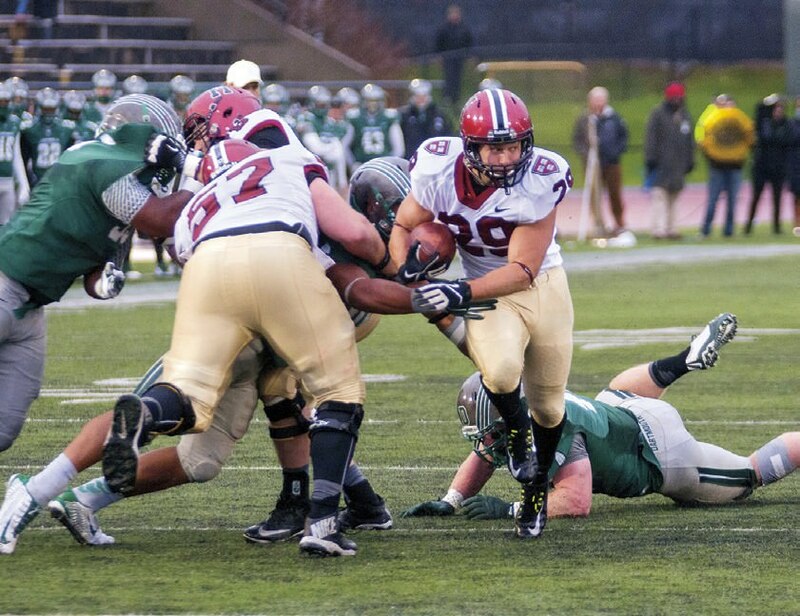 The Crimson football team already had clinched a share of the 2014 Ivy title. It had not lost all season. Yet despite the 39-degree chill, Harvard supporters among the sellout crowd of 31,062 were perspiring through their coats of cashmere, raccoon, and down. Yale, which had entered the 131st renewal of this ancient rivalry one game behind the Crimson in the Ivy standings, had pluckily rallied from a 17-point, fourth-quarter deficit to forge a 24-24 tie with 3:55 left. Harvard’s perfect season, the outright title, the prolongation of braggin’ rights…all were about to vanish, to be replaced by a winter spent gloomily pondering where this collapse ranked among all-time Crimson catastrophes. What ensued left us instead happily debating where the 2014 team stands among the all-time greats. In a drive that began at the Harvard 22, Crimson senior quarterback Conner Hempel used the skills of two juniors, running back Paul Stanton Jr. and wide receiver Andrew Fischer, to work the ball to the Yale 35. There, Hempel and Fischer decided to trot out a bit of deception: a pass pattern called “slant and go.” Lining up on the right, Fischer (as he had been doing all game) took a jab step toward the sideline. Yale defensive back Dale Harris bit on the move—whereupon Fischer pivoted and headed downfield. Seeing that Fischer had a step on Harris, Hempel reared back and fired. Fischer caught the ball in stride and cantered over the goal line. Touchdown! The Crimson led 31-24 with 55 seconds left. With this nailbiting triumph the Crimson achieved a 10-0 overall record, the seventeenth perfect season in Harvard history and Murphy’s third, joining the unblemished campaigns of 2001 and 2004. Victory in The Game allowed Harvard to finish 7-0 in the league, one game ahead of Dartmouth and two ahead of Yale, which fell to third place; Princeton, Brown, Penn, Cornell, and Columbia followed. In his 21 seasons in Cambridge, Murphy has beaten Yale 16 times. He has won or shared eight Ivy titles; this championship is Harvard’s third in four years. Even as the perfect season was unfolding, skepticism abounded. Preseason polling tabbed Harvard to finish second to Princeton. The autumn began with key players injured, among them seniors Hempel, leading 2013 receiver Ricky Zorn, and tight end Tyler Hamblin. There was also a question about how the defensive backfield would stand up against the better Ivy passers. Stuttering starts raised further doubts. In the opener, Harvard trailed Holy Cross at halftime (in an eventual 41-18 win) and repeated the pattern the following week against Brown (a 22-14 final). A 34-3 whipping of overmatched Georgetown was followed by a sluggish and scoreless first half against weakling Cornell. The 24-7 final score did not allay concerns, nor did the next Saturday’s 24-14 win over Patriot League foe Lafayette. • Defense. Harvard was fiendishly difficult to score on. “Our identity was as a defensive team,” said Murphy. In 2014 the Crimson allowed 12.3 points a game, by far the lowest in the Ivies. (Dartmouth’s D was next, at 21.0.) The front four was anchored by the Crimson’s all-time sack leader, Hodges, whom every opposing offense had to double-team. That allowed linemates such as senior Obum Obukwelu more rein to collapse pass pockets. Moreover, the hard-hitting defensive backfield—senior captain Norman Hayes, plus juniors Sean Ahern, Chris Evans, and Peters—morphed from a presumed target of opportunity to a thorny thicket for passers. “For the secondary to transition so quickly gave us a huge lift,” said Murphy. The most consistent unit may have been the linebackers, who lived up to the requirements set forth by legendary Florida A&M coach Jake Gaither: agile, mobile, and hostile. It produced the team’s four leading tacklers: juniors Jake Lindsey (63 tackles), Eric Medes (61), Matt Koran (60), and senior Connor Sheehan (56). The ’backers also had five of the Crimson’s 10 interceptions. • Depth. Fischer assumed Zorn’s primary receiver role so brilliantly that at season’s end, his teammates elected him most valuable player. As receiver, rusher, and returner, the little (five-foot-nine, 175-pound) man played big. Fischer led the Crimson with 55 receptions and, all told, accounted for a team-best 129.8 yards a game; that average was second in the Ivies only to the 154.5 of Yale’s brilliant senior back Tyler Varga. There were other heroes. When previously little-used senior running back Andrew Casten subbed for Stanton, the offense didn’t miss a step. When quarterback Hempel was out, junior Scott Hosch engineered six wins. If any position demonstrated the Crimson’s wealth of talent, it was tight end. The Crimson could line up five good ones: Hamblin, junior Ben Braunecker, sophomores Anthony Firkser and Ryan Halvorsen, and freshman Jack Stansell. • Drive. You could make a persuasive case that the Harvard offensive line was, as an entry, the league’s MVP. “It’s one of the more special groups in Harvard football history,” said Murphy. Keyed by 300-pound senior center Nick Easton, it flattened every defender in its path, gashed cavernous holes for running back Stanton (who often burst into the secondary untouched), kept Crimson passers upright (only 11 sacks all season), and wore down opposing defenses. The O-line was the main factor in the Crimson’s dominance during the second halves of games, when it outscored foes 174-75. The season’s defining stretch came during a two-week road test. At Princeton, the Crimson leapt out to a 28-0 halftime lead and never let up en route to a 49-7 blowout. Harvard racked up a school-record 698 yards of total offense, and Hempel completed 25 of 31 passes for three touchdowns and 382 yards. The next week, in a showdown of Ivy unbeatens at wintry Hanover, the Louisianan Stanton proved an all-weather back, mushing through the slush for 180 yards and two touchdowns. With six minutes left, senior Andrew Flesher nailed a 33-yard field goal to seal a 23-12 win. Back at the Stadium the next week, a 45-0 blowout of Columbia was marked by a school-record three interception returns for touchdowns, two by Sheehan. To this point, Yale, racking up nearly 43 points a game, had only one league loss, to Dartmouth. So if Harvard could win at Penn and the Elis could subdue Princeton at New Haven, that would set up a Game for the ages. Both missions were accomplished. Yale handled the Tigers 44-30, but in the Crimson’s case, it was a near thing. Playing in retiring coach Al Bagnoli’s final game at Franklin Field, the Quakers took a 24-17 lead into the final quarter. Then Flesher booted a 38-yard field goal, Hosch connected with Hamblin on a 28-yard touchdown strike, and Stanton (who gained 235 yards in 22 carries on the day) bolted 14 yards for his third touchdown, clinching a 34-24 triumph. Game on! Such was its significance and frenzy that ESPN GameDay, the TV college-football preview show with the biggest buzz, voyaged to Cambridge and presented its telecast hard by the Murr Center. The action matched the buildup, and then some. Yale led at halftime 7-3. In the third period, with the offensive line, as usual, kicking into gear, Hempel rammed the ball down the Elis’ throats. In a 58-yard drive, he mixed his own runs with those of Stanton and Casten, plus passes to Fischer and Hamblin. When Stanton took it in from the one, Harvard had the lead back, 10-7. Later came some typical Murphy big-game prestidigitation. From the Yale 40, Hempel handed to Stanton going left. Stanton handed to senior wide receiver Seitu Smith going right. Smith stopped and saw Fischer behind the Yale defense. Smith threw. Fischer gathered it in, ripped out of a tackler’s grasp, and trotted over the goal line. “The last game of the season is the time to bring out the trick plays,” Fischer said later. “All week, we had practiced them perfectly.” Practice paid off: Harvard 17, Yale 7. Back came the Elis. Starting at their 25, Yale marched to the Crimson 16. Then quarterback Roberts heaved a pass to the left intended for wide receiver Robert Clemons III. It hung up long enough for Sheehan to arrive at Clemons at the same time as the ball. Sheehan wrenched it from Clemons’ mitts on the 10 and set sail the other way. Ninety yards later, it was Harvard 24, Yale 7. At this point Harvard fans were feeling relaxed, with reason. But in the next 11:22 of play, spearheaded by the crashing, slashing, dashing Varga, the Elis rallied to knot it up. It induces shudders to contemplate what the Yale offense could have done had it had more than 55 seconds to work with following the winning Hempel-to-Fischer touchdown. Where the 2014 team might have an edge is in depth, resilience, and gumption. Players went out of the lineup and others came in with little apparent dropoff. Through adversity, “there never was any ‘Woe is me,’” said Murphy proudly. In this regard, the 2014 Crimson team harks back—way back, long before the Murphy era—to the overwhelmingly efficient machines of a century ago molded by Percy D. Haughton, A.B. 1899. It’s a debate—a perfect one—to warm our winter. Tidbits: Harvard’s record in The Game now stands at 58 wins, 65 losses, and eight ties; since the Ivy League was formalized in 1956, the Crimson leads, 34-24-1. Harvard has beaten Yale in eight straight Games, tying the Elis’ 1880-89 teams (no games in 1885 or 1888) for the longest streak in the series, and in 13 out of the last 14…The visit by GameDay was the program’s second to an Ivy venue, the first having occurred in 2002 at Franklin Field when the Crimson played Penn. For his weekly prediction segment, co-host Lee Corso donned a bulldog mask to signify his pick of Yale. Corso thus almost certainly forfeited any chance of being awarded an honorary degree at Commencement. Streaks alive! Harvard now has gone 14 years with at least seven victories, an Ivy record….The Crimson has won 14 consecutive games, with the last loss being a 51-48 defeat in three overtimes to Princeton on October 26, 2013….Harvard has won 10 straight on the road since a 30-21 loss at Penn on November 10, 2012….The Crimson has not been shut out in an Ivy record 168 games, dating from a 24-0 loss to Columbia on September 19, 1998. Harvard surpassed the previous mark of 162, held by Brown, when Flesher booted a 24-yard field goal in the first quarter against Lafayette this fall….The Crimson has blanked Columbia three straight seasons and has not allowed a point to the Lions in 189 minutes, 31 seconds of play. Mr. Accuracy: Hempel finished his career as the Crimson’s all-time leader in completion percentage, with a mark of 66.5 percent (234 completions in 352 attempts). Next best: Rose (.624, 455 of 729). Sibling act: Seitu Smith and Semar Smith ’18 became the first Crimson brothers to score in the same game when each reached the end zone against Columbia. Seitu tallied in the second quarter on a 37-yard pass from Hosch. In the next quarter, Semar matched his big brother, tallying on a three-yard rushing play. Wreaths of Ivy: Murphy was named the league’s Coach of the Year, an award initiated this season. His record at Harvard is 147-62, and he has 104 Ivy victories, placing him third all-time behind Yale’s Carmen Cozza (135 from 1965-96) and Bagnoli (111)….Nine Crimson players were named to the All-Ivy first team: on offense, Hamblin, Stanton, Easton, and junior tackle Cole Toner; on defense, Ahern, Hayes, Hodges, Obukwelu, and Sheehan. Hayes, Hodges, and Stanton were unanimous selections.…For the second year in a row, Hodges was a recipient of the Bushnell Cup as Ivy League Defensive Player of the Year (sharing 2014’s award with Princeton linebacker Mike Zeuli). He also led the league in quarterback sacks for a second season, with 8.5, pushing his career total to 27.0, the most in school history….Nine other Crimson players received either second team or honorable mention nods. The 18 All-Ivy tabs were the third most in Crimson history (20 in 2007 and 19 in 2009). Oh, captain, our captain: Matt Koran, of Joliet, Illinois, and Mather House, will captain the 2015 Crimson team. In the season just past, besides his previously noted 60 tackles, he was credited with one forced fumble, and had a 34-yard interception return for a touchdown against Columbia.